SSL (Secure Sockets Layer) encrypted connections allow more secured transfer over network. Many web services and websites use SSL encryption for more security from hackers and other malicious elements on the internet. https is more secured version as compared to http and you can even force web browser for automatic http to https settings using plugins. Just like Gmail, more you can check Hotmail emails in more secured https environment. 1. Just goto https://www.hotmail.com/ and proceed to login into your email account. 2. After login you will get prompt as shown in screenshot below. Click on ‘Always use https (recommended)’ button to active https setting for your Hotmail account. 3. To configure settings further click ‘change your settings to always use HTTPS’ on https settings page. 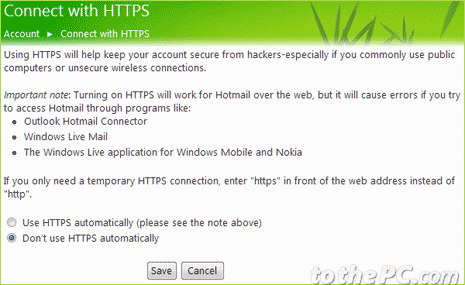 Then you will get settings page to easily enable or disable https SSL encryption settings for Hotmail email account. While https settings will ensure more secure access to Hotmail on the internet, this will cause error while accessing Hotmail through programs like Outlook Hotmail Connector, Windows Live Mail, the Windows Live application for Windows Mobile and Nokia. If you only use Hotmail via web browser, then enabling https setting in highly recommended. Mate I want to disable3 https settings. It is screwing around with my ability to send flash pdf files. Have been sending these files without problems for ages. Now I can’t do a stitch of work. Desperate. How do you disable this function?